Thailand is now in chaos hence, to stop and possibly avoid serious trouble in terms of peace and economic stability, the Military has imposed Martial Law today, May 20, 2014. Read the full news below. 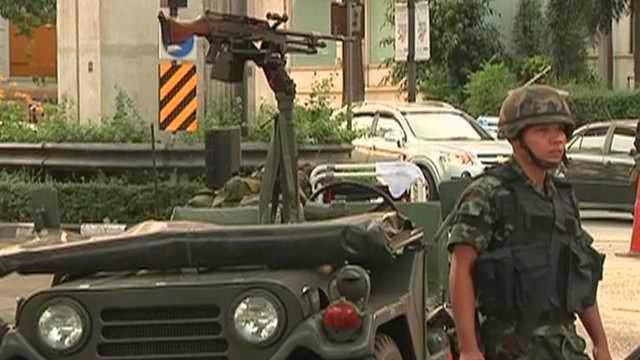 BANGKOK - Thailand's army declared martial law on Tuesday to restore order after six months of anti-government protests which have left the country without a proper functioning government, but the move did not constitute a coup, military officials said. The caretaker government was still in office, said deputy army spokesman Colonel Winthai Suvari, following the surprise announcement on television at 3 a.m. (2000 GMT Monday). "This martial law is just to restore peace and stability, it has nothing to do with the government. The government is still functioning as normal," Winthai told Reuters. Thailand has been stuck in political limbo since Prime Minister Yingluck Shinawatra and nine of her ministers were dismissed on May 7 after a court found them guilty of abuse of power. An acting prime minister has since taken over.